HEY HEY. We'll be seeing you very soon - our European tour with Blossoms and Callum Beattie kicks off next week and we can't wait to get back out on the road to play some tunes for you wonderful people. 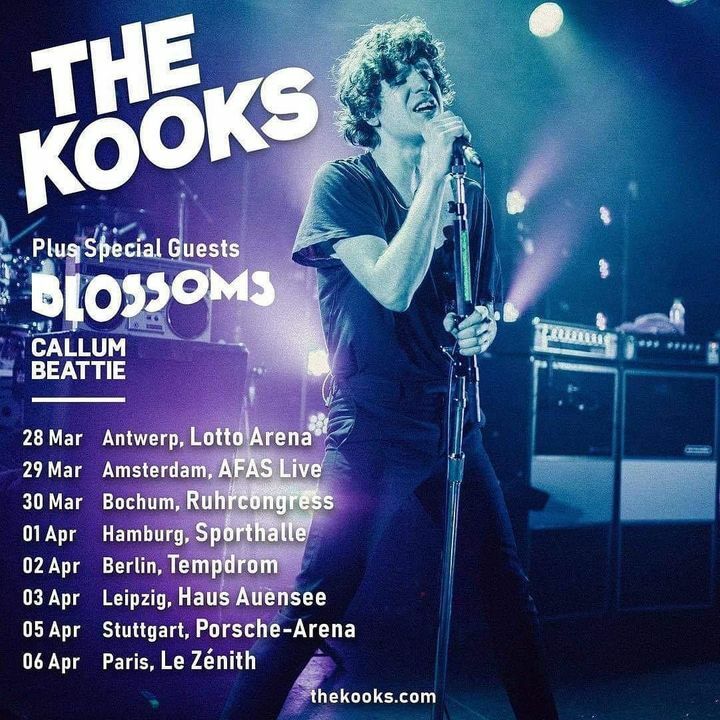 Remaining tickets can be found at thekooks.com - get them while you can! https://lauteleisetoene.weebly.com/konzertberichte/the-kooks-erobern-berlin Gestern durfte ich THE KOOKS ein weiteres Mal in Aktion erleben! Es war eine tolle Stimmung und das Publikum tanzte, aufgeladen von Vorfreude, Sonne, Bier und Freundschaft, bereits zu den 80er Songs, die während des Umbaus gespielt wurden. Die Laune wuchs mit jedem Oldie, der uns entgegen schepperte. Als die ersten, heroischen Akkorde dann endlich erklungen ging der Jubel los... Der Ganze Artikel auf Laute Leise Töne! Great Show! A good mix of old and new music and kept everyone up on their feet. Would love to see the guitarist jam a little longer on some songs because it looks like he wants to. The opening acts were a lot of fun to watch too and enjoyed their music . It was amaziiiiing !!!! I did not only go to the concert but started outside until they got out and MET THEM. They’re so nice and I love them all. About Live Nation... all of them are extremely mean and you can tell they hate their job. Only one guy was really really really nice !!! Best performance you will ever experience!!! Not only did we receive an encore of a couple more songs but we got to listen to some never performed music!!!! Wooohoooooooo!!!!! Best day of my life 😍😭 they ended it with their classic hit, Naive which was definitely nostalgic and a bittersweet moment since it was the end of a beautiful concert. Thumbs up all the way!